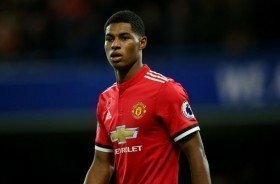 Manchester United have reportedly opened negotiations with Marcus Rashford regarding a fresh long-term contract with the club. The Englishman has been one of United's most consistent performers since Ole Gunnar Solskjaer took over the reigns and he has netted six goals in the past eight league matches. According to PA Sport, the club's hierarchy have now begun talks over a long-term contract with the marksman with his existing deal due to expire in 17 months' time. Rashford had been in-and-out of the starting lineup when Jose Mourinho was the club's head coach but his fortunes have changed since the Portuguese's dismissal with him securing a regular role leading the line. This has already witnessed Romelu Lukaku drop to the substitutes' bench and the same trend may continue in the forthcoming weeks, provided Rashford manages to maintain his consistency in terms of the scoring. United are currently fifth in the league standings with 48 points following their slender 1-0 win over Leicester City last weekend where Rashford was on the scoresheet.